Mackenzie is now sticking to her chores with the motivation of this board. IMAGINE a child who fed the fish without being asked. Made their beds as soon as they woke up. Or cleaned the kitchen bench - just like that. Most parents may say that is what dreams are made of, or liken it to having a magic money tree thrive in the backyard. But Queensland's Sarah Girvan has found a simple solution - and it's working. 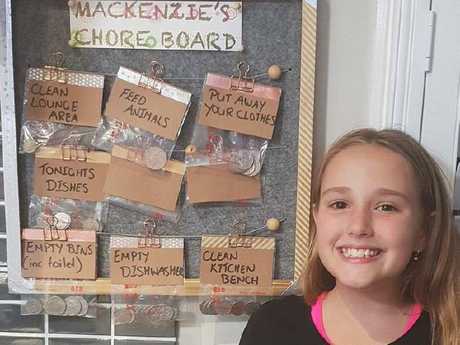 The 44-year-old mother-of-four made a chores chart for 10-year-old daughter Mackenzie - who is happily earning up to $10 a week, broken up in various household jobs to save money for her favourite things. 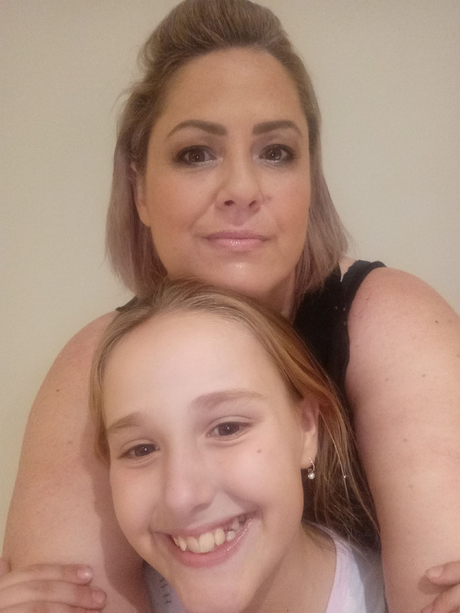 "Mackenzie was wanting to earn money to spend on her hobbies so I looked online for chore charts and found one that was a similar concept to what I hacked," Ms Girvan told news.com.au. "Knowing Kmart is nice and affordable, I knew I would be able to find something to create something that would work for us. So I bought some decorative tape and bank money bags to make the chart. "I chose chores that Mackenzie would achieve and I can change them up with blank bags." She said the coin bags were put on the chart at the beginning of the week, and usually added up to $5 or $10 in total - the perfect incentive for Mackenzie to pitch in and earn her keep. 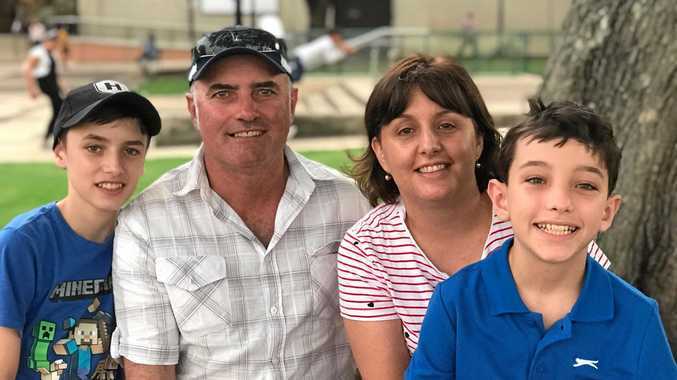 "Mackenzie has the option of when and what she wants to do - some weeks it's all done early in the week because she has something she would like to buy, other weeks chores can roll over because she doesn't want the money for anything particular," Ms Girvan said. "It works for us, and it is just another fun way of her earning pocket money." Posting her chore chart on social media, Ms Girvan said she received backlash for giving her child chores, and then paying her to do what some considered to be standard jobs with no pay necessary - and even paying her too much. Mackenzie is now planning when she’ll do her chores and saving money for things she wants to buy. "But it works for us, and that is all that concerns me," she said. 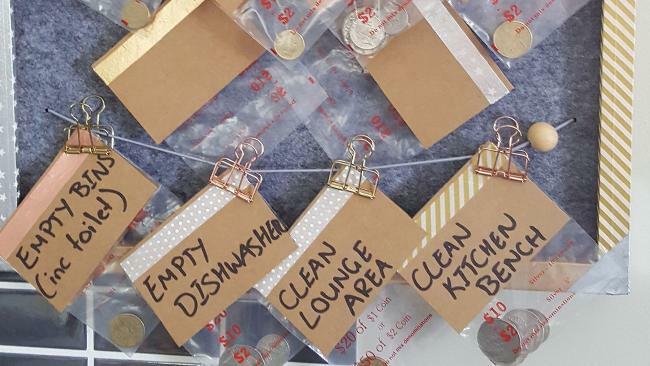 "We as parents were sick and tired of being a money tree, constantly handing out money for this or that, so we decided to introduce the pocket money system so she can buy her own extras or save up for the bigger items." She said her daughter spent her hard-earned cash on anything from products to make slime, books or the occasional treat at the grocery store. "It has helped Mackenzie understand the value of money and working hard to achieve it," she said. "I feel it gives Mackenzie the choice of how much she would like to earn and what jobs she is willing to do - so some jobs she only gets 50 cents, but she might get the option to earn it a couple times a week." Sarah says despite some criticism, she’s thrilled with the way the board is working, especially as it’s teaching Mackenzie the value of money.